Barack Obama, Vladimir Putin, and Ukraine: The president has bungled his dealings with the Russians over Crimea. 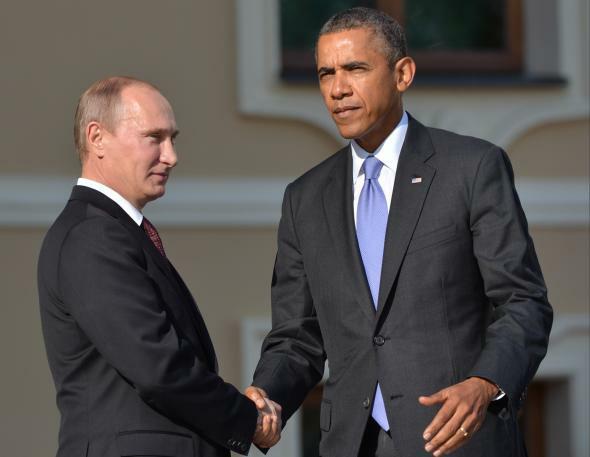 President Obama has bungled his negotiations with Vladimir Putin. President Obama has had two long phone calls with President Putin in recent days, but as long as he insists on preconditions for renewed diplomacy, Putin has no reason to comply. The most startling thing about the crisis in Ukraine is how horribly all the actors have played their hands. Then, Putin went overboard, not merely bolstering the security of Russia’s naval base on the coast of Crimea (an autonomous republic of Ukraine that once belonged to Russia) but mobilizing 30,000 troops to occupy the entire enclave. This was unnecessary, since Putin already, in effect, controlled Crimea. It may also prove stupid, as the move’s violence has further alienated Ukrainians, raised suspicions among Russia’s other ex-Soviet neighbors, and roused resistance from otherwise indifferent Western nations. Which leads to President Obama, who has responded to the aggression by imposing sanctions—a cliché of foreign policy that usually has no effect, but in this case will almost certainly make things worse. Sanctions only work (and, even then, rarely) when they are universal, when they truly hurt the regime being targeted, and when they coincide with—or prompt—political change. Russia fits none of these categories. Too many European nations are too dependent on Russian gas supplies or bank deposits to make sanctions bite or endure. None of the sanctions under discussion are knockout blows; no conceivable sanctions would compel Putin (or any Russian leader) to surrender Ukraine. And regime change in Moscow is hardly on the horizon. This crisis will be settled by making things somehow right with Ukraine—keeping it secure from further encroachments and ensuring that its government reflects the will of its people. The path toward both goals runs through the upcoming elections in May. And neither goal can be accomplished—no free and fair election can take place—without Russian involvement. That is a simple fact. Russia’s ties to Ukraine run long and deep. Any new Ukrainian government, even one wishing closer ties to the European Union, will have to renew ties with Russia as well. The EU can’t (and certainly won’t) solve all of Ukraine’s economic ailments. Nor will some surge of American gas exports (a fantasy to begin with) pry Ukraine loose from its dependence on Russian energy. But then, President Obama announced sanctions against Russia, banning travel of key officials, freezing assets, and suspending international forums. The question that no one appeared to acknowledge, much less ask or answer: How is it possible to do escalation and de-escalation at the same time? Yes, there are situations where a shrewd combination of “sticks and carrots” can prod an adversary into action, but this isn’t one of those situations. The sticks are too flimsy, and there are no carrots. More to the point, if Putin had been looking for some way out of this mess, he certainly wouldn’t be looking any longer, because de-escalating now would make it seem that he was backing down under Western pressure. Obama has had two long phone conversations with Putin in recent days, but as long as he insists on preconditions for renewed diplomacy (Putin must return his troops to their base, he must sit down with Ukrainian officials), Putin has no reason to comply. Russia has deeper interests in Ukraine than the West does—and more localized sources of pressure to make those interests felt. That being the case, Putin can sit and wait. He has the upper hand in this game—and the more the West plays on his terms, the stronger his hand will seem. Sanctions won’t change his behavior, except to stiffen it—and once that becomes clear, Putin will seem stronger, the West will seem weaker, and a solution to the Ukraine crisis will recede in the distance. Already, Putin has doubled down, calling for a referendum on whether Crimeans want to rejoin Russia (they will almost certainly vote “yes” by a large margin) and promising other rejoinders, such as freezing Western assets inside Russia. None of this will work to his benefit in the long run, but he can feel good about himself in the short run—just as Americans in Congress (who have pushed Obama in this direction) can feel good about voting for additional sanctions as well (and then, no doubt, shrug off all the consequences if things fall apart). Sanctions do have a place in this sort of confrontation, but Obama got the sequencing wrong. The “costs” and “consequences” of Russia’s actions should have been laid out on the table as measures that he would take if Russia didn’t take steps to wind down the crisis. If possible (and maybe it isn’t anymore), this warning could have been conveyed in private, and in any case there should have been no public demands on precisely what winding-down steps the Russians must take. Whatever leverage we might have had is lost, once the chips are already spent—and are shown to have no value. There are other steps the United States and NATO can take, and, in fact, Obama has taken them. Most notably, he’s beefed up defenses around the Baltic nations and Poland. In part, this complies with security guarantees to fellow NATO members; in part, it sends a warning to Putin not to make further incursions into southern or eastern Ukraine—though it’s hard to say what we would do if Putin did. When this crisis got underway two weeks ago, it seemed absurd that the United States and Russia might go to war over the fate of Ukraine. But both of their leaders have stumbled and bumbled so badly in the meantime, and the exit-ramp is so littered with bombs and barricades, nothing seems impossible.